Multipurpose Gateway Motorsports Park, in the shadow of the famed St. Louis Gateway Arch, returned to the NHRA Mello Yello Drag Racing Series schedule in 2012 after a one-year hiatus with a new event in the Countdown to the Championship. The track previously held events in the summer beginning in 1997 that were known for surprise winners. Tickets can be purchased online by clicking the TICKETS button above or by calling 618-215-8888. Purchase early and save! How to Get There: Five minutes from downtown St. Louis, the track is on Interstate 55/70 at Exit 4. From St. Louis, take I-70 south to I-55/70 and travel east to Exit 4. 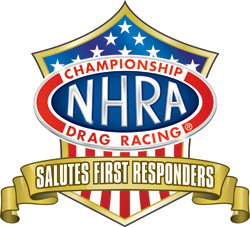 As part of the tribute, first responders will be eligible for discounted tickets to the AAA Insurance NHRA Midwest Nationals through GovX. Click here to purchase.